We've got brilliant news for you! 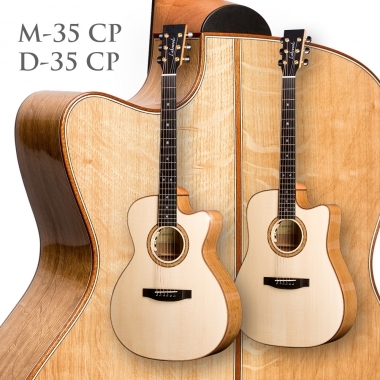 We proudly present two new Lakewood guitar models: The M-35 CP and the D-35 CP! Some people who joined us at the Lakewood guitar exhibition in our workshop last month were already able to have a first go on those guitars. But one step at a time. What does the 35 mean at all? The style code 35 stands for oak as timber for guitar back & sides in the Lakewood Customshop world. For more than a year we have been offering oak in the list of possible options when it comes to the choice of back & sides timber. The usage of European indigenous timbers for instrument making has always been of our interest. If you are familiar with our Customshop you might be aware that we have been offering alternative European woods for quite a few years now and the fact that it is always worth to seriously think about using them for a guitar. A growing quantity of guitarists consider the ecological aspect at least interesting. Our knowledge about oak as a suitable tone wood could thus be extended by even more detailed experiences in the past two years while we learned more about this timber. The more we learned the more excited we got! Eventually, we decided it's about time to take on two new models to the Deluxe Series, the D-35 CP as a dreadnought shape guitar and her little sister the M-35 CP Grand Concert model. They complement the other models of the Deluxe Series (the most popular so-called 32 models, i.e. the much-loved M-32 CP) in a fantastic way. The guitars behave superbly in terms of response and know how to surprise with a super complex tone that gets any audiophile person abuzz. Both guitars are in no way less exciting than their popular rosewood / spruce siblings. Present mids are supported by a profound bass and topped with rich harmonics. That's how far we go for now. The rest is up to you when you are trying one of those stunning models in your nearest music store. You will most certainly be surprised! Finally, here's another tasty detail to reveal about the oak timber. We get the wood from France, exactly from the region where they cut trees for manufacturing barrique barrels. There's oak tree sections that are not suitable for barrel making but even more for guitar making and vice versa. Well, that's what you call a symbiosis! What's good for a noble wine can't be wrong for an acoustic guitar, can it! ?